Son of John H. Chafee, grand-nephew of Henry F. Lippitt, both long-time Republican Senators from Rhode Island. Also a grand-nephew of early 20th century civil rights activist Zechariah Chafee. Educated in private schools and worked as a blacksmith before entering politics, as city councilman and later mayor of Warwick, RI. Almost literally inherited his US Senate seat — he was appointed 2 November 1999 to fulfill his father's term after the elder Chafee's death. Elected to a full term in 2000, defeating Congressman Robert Weygand. Moderate Republican whilst in the Senate. Supported abortion rights, gay rights, pay-as-you-go legislation, tax subsidies for companies which move US jobs offshore, and the USA PATRIOT Act. Only Republican in the Senate who opposed the 2003 Iraq war authorization. Defeated for re-election by Sheldon Whitehouse in 2006. Publicly resigned from the Republican Party after leaving the Senate, declaring himself an independent and complaining of Republicans' rightward drift on issues including the economy, the environment, and the war in Iraq. Elected Governor of Rhode Island in 2010, succeeding term-limited Republican Don Carcieri and becoming the first independent candidate elected to that post. Switched to the Democratic Party in 2013. 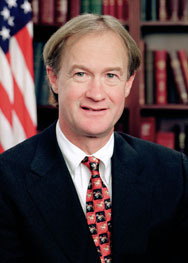 Announced his candidacy for the Democratic Party's Presidential nomination in 2015. Switched from Republican to Independent in 2007 and from Independent to Democratic on May 30, 2013.